As with Samuel and Chronicles, Greek translators divided Kings, or Melakim, into two books, perhaps simply for the practical reason that Greek required more scroll space than Hebrew. Scholars believe 1 and 2 Kings are a compilation rather than a single author’s work. Archaeology has revealed that some information in this historical work came directly from official temple records. The Talmud names Jeremiah as the work’s compiler, though some scholars credit Isaiah. Judging by its ending, the book was compiled at or shortly after Judah’s Babylonian captivity, around 560 to 540 B.C. During this fascinating period of Near Eastern history, Israel and Judah maintained close contact with the surrounding nations; Solomon even married one of Pharaoh’s daughters. Egypt still struggled for dominion over Palestine and Syria. Assyria achieved its height of power, only to be conquered by Babylon as Nebuchadnezzar achieved control over most of the Near East, including Judah. Records from Egypt, Assyria, Babylon and Moab mention conquests of or battles with Israel and Judah. 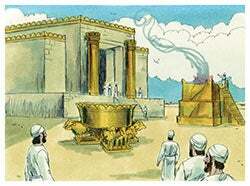 Sequels to 1 and 2 Samuel, 1 and 2 Kings trace Israel’s history through Solomon’s reign, the nation’s division into two kingdoms, Israel’s disintegration, and Judah’s captivity. On the surface, it appears that the books purposed simply to record Israel’s and Judah’s history. However, the compiler incorporates spiritual insight into the books’ unmatched historical detail and accuracy; he emphasizes spiritual lessons as much as historical facts. The stories reveal a theme of how God used the Israelites’ experiences to accomplish His purposes. In contrast to the historical records preserved from Israel’s contemporaries, which tell only of events that extol their kings’ virtues, Israel’s records sought to glorify God and therefore included their leaders’ weaknesses as well as their great feats. God intended that the Israelites live in such a way as to display His character to the rest of the nations on earth. But they chose not to do so, and without God, the nation could not endure. Revealing the consequences of the choices described in Judges, 1 and 2 Kings show how man’s choices continually disrupt God’s plans for His people. Today, though the Israelites failed to accomplish God’s purpose for them, our hope lies in the Eternal King who will reign over Spiritual Israel in the New Jerusalem. In this Christian walk, as Elijah experienced, there will be “mountaintop” highs and deep “valley” lows. These highs and lows are a natural part of the process, and neither lasts as long as it seems it will in the moment. Through it all, God does not forsake us; He is there all the time, even if it be in a still, small voice.